When Georgia Governor Jimmy Carter addressed the United Methodist Conference in 1972 and proclaimed that, above all he was a Christian, it resonated well and became the basis for his success in becoming the 39th president of the United States. "I am a peanut farmer, but I am a Christian," he told the Methodists and followed with other descriptions of who he was, including governor of Georgia, always ending with the phrase, "but first of all I am a Christian." He went on to proclaim that the purpose of politics was to establish justice and mercy, and that Christianity meant to love God and "whoever is standing in front of you." As a result, according to religion historian Randall Balmer, the message resonated with progressive evangelicals whose agenda included many social issues Carter espoused such as ending racial discrimination. Such an agenda had faded in 1920 when William Jennings Bryan ran for president, Dr. Balmer said, but Carter's message breathed new life into the movement. Balmer (left) delivered the annual Holley-Hull Lectures at Samford University Oct. 2-3. Carter beat George Wallace in Florida and carried North Carolina, and evangelicals became the key proponent of his campaign. For the first time, one of "their own" was a candidate for president. This notoriety catapulted Carter and evangelicalism into the national spotlight. A national magazine declared 1976 as the Year of the Evangelical. "The story of how evangelicals abandoned one of their own during the course of Jimmy Carter's presidency remains one of the great paradoxes of American politics," Balmer said. "Having ridden this wave of progressive evangelicalism and New South capaciousness to the White House, Carter expected that the last constituency he needed to worry about was evangelicals," he continued. "He was, after all, representing the best of that tradition by advocating human rights, peace in the Middle East, better more equitable relations with Latin America, and a less imperial foreign policy. Domestically, his support for public education, racial reconciliation, and the proposed Equal Rights Amendment of the Constitution were utterly consistent with the principles of nineteenth-century evangelicalism." But the emergence of the Religious Right with its belief in less government eroded Carter's support, according to Balmer. One reason the movement gained strength was the federal government's denial of tax exempt status for several Christian schools found in violation of the Civil Rights Act of 1964, he noted. As the election of 1980 approached, the conservative faction had put together an estimable political machine that would deny Carter a second term, Balmer said. Balmer is the author of more than a dozen books including Mine Eyes Have Seen the Glory: A Journey into the Evangelical Subculture in America. He taught at Columbia University for 27 years before being named to an endowed chair in arts and sciences at Dartmouth College in 2012. 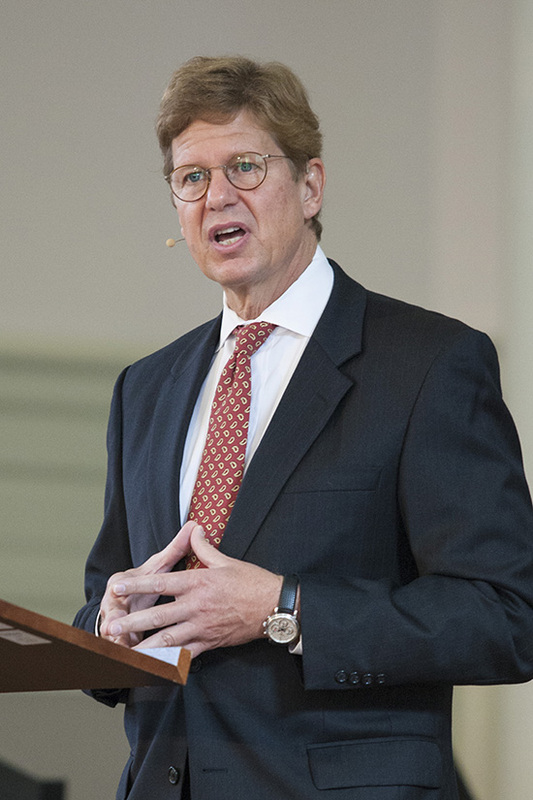 The Howard L. and Martha H. Holley Lectures--New Testament Voices for a Contemporary World are sponsored by the Samford religion department in honor Dr. William E. Hull, Samford research professor and retired provost who has written widely on Christian themes.